Alleged Nazi camp guard John Demjanjuk was formally charged Monday with being an accessory to about 27,900 murders during World War II. The Munich State Court ruled 10 days ago that the 89-year-old retired auto worker from Cleveland, Ohio, was fit to stand trial. Demjanjuk, a native Ukrainian, denies any role in the Holocaust. He says he was a prisoner of war during the conflict, not a camp guard. He was deported in May from the United States to Germany, where he was wanted for his alleged involvement during World War II in killings at Sobibor, a Nazi death camp in Poland. 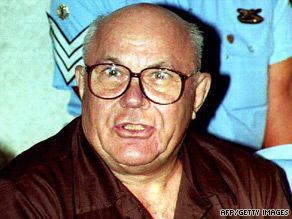 The German court originally accused him of complicity in about 29,000 murders. The prosecutor’s office said it revised the number downward because some of those who had allegedly died in the camp when Demjanjuk was there were already dead during the transport to Sobibor. Demjanjuk lost a U.S. Supreme Court case against his deportation. His lawyers had asked the high court to consider their claims that he was too ill and frail to be sent overseas. They also raised human rights and other legal issues. While Demjanjuk has been deemed fit to stand trial, doctors have restricted the time he can be tried each day to two sessions of 90 minutes each, said Anton Winkler, Munich state prosecutor. The court has not announced a date for the trial to begin, but Winkler believes it will be in the autumn because of Demjanjuk’s frail health, he said. A federal court restored Demjanjuk’s citizenship, ruling the government withheld evidence supporting his case. But his citizenship was revoked again in 2002 after a federal judge ruled his 1952 entry into the United States was illegal because he hid his past as a Nazi guard.